As many artists will tell you, “plasticity” applies no less to painting, a discipline that begins with marks on a surface, and ends up, with a little luck and much hard work, as complete and meaningful expressions. Tibor de Nagy’s inspired pairing of exhibitions reminds us that, in regards to contemporary painting, plastic expression remains as varied as artists’ temperaments. The gallery’s main space features six large, geometric abstractions from the 1970s by the Paris-based painter Shirley Jaffe (b. 1923). The artist’s elegant, planar colors pulse across these canvases in a profusion of shapes: polygons with looping or saw-tooth edges, ziggurat-like forms, stacks of triangles, thick serpentine or zig-zagging lines. 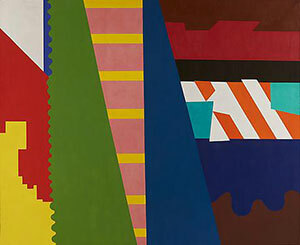 In the six-foot-tall “The first Diagonal” (1973), two triangles – one dark bluish-green, the other olive-green, with a busily scalloped edge – stretch the painting’s full height, held apart by a ladder of yellow and muted pink bars. A dance of notched, striped and billowing forms surround them, each a new, spry hue: blue, orange, warmer and barely cooler reds. If Jaffe’s color seem charged from within, almost primal in their elegance, her shapes seem consciously applied from without, steered by a playful cognizance of geometric possibilities. The artist’s enthusiasm is infectious, inviting the viewer into a frolic that feels at once footloose, wise and contained. Staver is a natural colorist, and such gambits of hue resonate throughout these paintings. But most impressive ultimately is her discipline of rhythm. In “Groupers” (2013), an exuberantly pink diver, her hair and legs curling backwards like a human shuttlecock, descends to within inches of her counterpart: a dark, barely visible figure – drowned, possibly? – curling the opposite way. A school of immense fish, their mouths identically agape, surrounds them in a sonorous arc. Staver’s colors weight each unfolding event: sinking, converging, pausing. In “Syrinx” (2013) all movements revolve beneath a single point: the crosshairs of tree’s branches over a moon, held at a remarkable distance and height by the intruding darkness and overlapping branches. 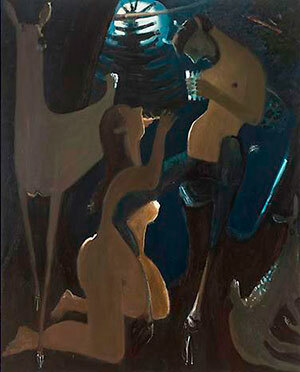 An array of creatures – woman, deer, and the goat-legged Pan – pose below at various heights, their legs meandering towards and intertwining in the depths far below – in the “strange seas of thought,” as one writer described certain late works by Beethoven.